Food Costs > How Much Does Salmon Cost? How Much Does Salmon Cost? Salmon, which belongs to the trout family, is prized for its taste as well as the health benefits. Salmon are anadromous, which means they are born in fresh water; they then migrate to the ocean and return to freshwater to reproduce. Salmon can be purchased live or the meat can be bought fresh or frozen. The price of salmon depends on the seller, the time of year, how it’s processed as well as the type of salmon that you purchase. On average, salmon can cost anywhere from $4 frozen to as much $25 per pound for fresh fillets. Wild salmon is going to cost the most. For example, Coho or Sockeye Salmon is going to cost more than an Alaskan Salmon. Certain times can affect the pricing as well. 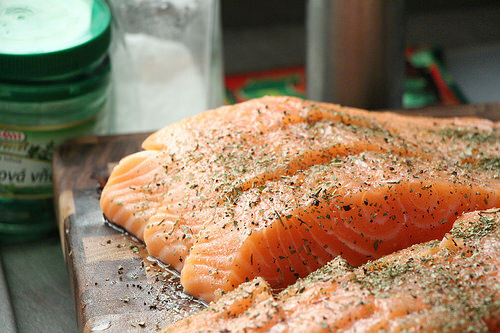 For instance, Pacific salmon, which is highly preferred by most, can be in season during the months of May and June. However, if the salmon is farm raised, it will never be in season. Fresh whole salmon can cost $17 to $25, depending on the type of salmon. For example, whole wild caught Alaskan King salmon can retail for about $20 per pound whole, while Copper River Sockeye salmon can retail closer to $16 per pound whole. White King salmon can be in the $20 per pound range as well. Salmon filets such as a Copper River king, Alaskan king, and Columbia River king can sell for anywhere from $7 to $24 per pound depending on the type of salmon. These fillets, often referred to steaks as well, will be prepped and ready to be thrown on the grill or frying pan. A wholesale club, such as Costco, can have filets of Salmon already prepped. For something such as this, it could retail for $7 to $13 per pound. Keep in mind that this fish won’t be as fresh as one that you could find in a local fish market. Smoked salmon that is processed in a box can retail for $18 to as much as $38 for a 16-ounce box. For example, the SeaBear Smoked Salmon retails for $34 to $38. Canned salmon can cost $1.50 to $2 per seven-ounce container. Salmon is high in Omega-3 fatty acids, high in protein and amino acid. It’s also low in sodium and a very good source of Vitamin B6, Phosphorus and Vitamin B12. One pound of raw salmon will have 944 calories, 62 grams of fat, 250 milligrams of cholesterol, 268 milligrams of sodium, 1,647 milligrams of potassium, 0 grams of total carbohydrates and 92 grams of protein. A salmon fillet, if purchased online, will often weigh four to six ounces. Online fish markets may charge an additional fee for shipping since it has to arrive on your doorsteps within 24 to 48 hours on average. These shipping fees may be waived if you were to meet their minimum spend. How much salmon per person? As a general rule of thumb, serve about six to eight ounces for every person eating. For an appetizer, it should be about two to three ounces. Also, before committing to these numbers, be sure every guest enjoys salmon before prepping and cooking for everyone. The NASDAQ Salmon Index reported that salmon prices have soared more than 50 percent in 2016 due to a spread of parasites, which nibble on the fish’s blood and tissues. Purchasing salmon at local fish markets is going to taste a lot better than a salmon filet at your local grocery store. It is best to compare quality rather than the price tag.